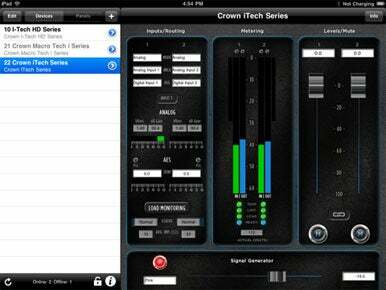 Professional audio equipment manufacturer Harman has released Powered by Crown, an iOS app that can control its ethernet-based line of Crown amplifiers from an iOS device. The app is compatible with Crown and JBL digital audio systems that operate over an ethernet connection; it can be used to perform a variety of tasks, like equalizing the sound, verifying output levels, and even monitoring the waveforms produced by an amplifier in realtime. In addition, Powered by Crown supports an unlimited number of audio systems, as long as they are all connected to the same network. Users can also create custom control interfaces using Harman’s System Architect software that can be synchronized to Powered by Crown through iTunes. In March, Pioneer introduced a new line of Apple-focused consumer A/V receivers that can also take advantage of iOS device control. The Powered by Crown app is compatible with an iPad, iPhone, or iPod touch running iOS 3.1.3 or later for $4, and is available now.